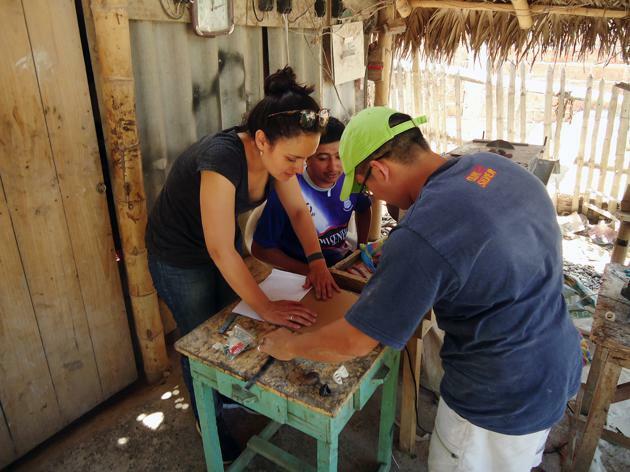 Paola Delgado is committed to giving back to communities in her native Peru. When Lima native Paola Delgado decided to put an end to her career as an investment banker at Goldman Sachs, she only wanted one thing—to “find” herself. After four years of working long hours on Wall Street evaluating companies, preparing IPO offerings, and consulting financial clients, she wanted more. “I was looking for balance,” she says, smiling from behind a conference table in her new office in the hip DUMBO neighborhood in Brooklyn. 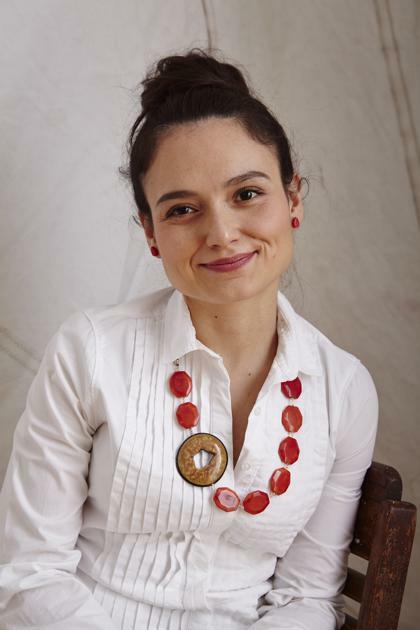 Dressed in a loose pale pink shirt and blue jeans, her hair up in a simple bun, Delgado oozes youthful energy, her eyes flash with enthusiasm as she talks about beads, hooks, clasps, and colors. Her search for balance led her back to her native Peru, where she started making jewelry—something she did as a child. “I fell in love with it all over again,” says the 31-year-old designer. With the help of her sister who was working on a sustainability project in Peru, she learned about the natural materials she could use that won’t damage the environment. 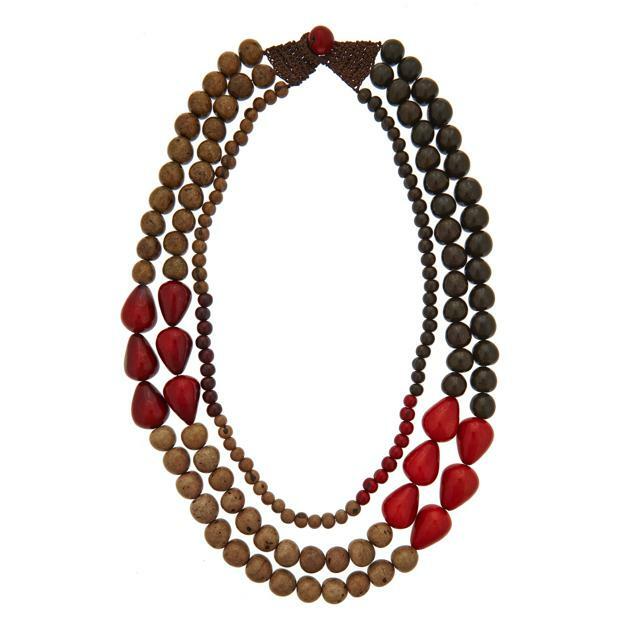 Tagua seeds from palm trees that grow in the Amazon became her signature material. Because the seeds are collected after they have fallen to the ground, the harvesting process doesn’t damage the source. But Delgado faced one problem: This wasn’t a novel idea. “Jewelry made from seeds and wood has been done for centuries. I felt like the materials and the possibilities are so unique, but, sometimes, the quality and the design aren’t that good. So I set myself to become the Alexis Bittar of artisan-made jewelry,” says Delgado referring to the New York-native jewelry designer known for his hand-made Lucite pieces. And so Mujus was born. Pronounced Moo-hoos, the name means “seed” in Quechua, an ancient Peruvian language. Quality became key for Delgado, so she spent months traveling around the country meeting with artisans and looking for the best materials and innovative techniques. All of her accessories are handmade by artisans in Quito, Otavalo, and Manta in nearby Ecuador (where she now has a workshop) and Arequipa and Lima in Peru. Having grown up in Peru in the 1980s when a high-unemployment rate and internal conflicts were tearing the country apart, Delgado saw the struggle of low-income families, especially women who bear the full responsibility for raising their children. She set up Mujus as a sustainable company that pays its artisans a fair wage. “They need to feel valued. People’s product always depends on how valuable they feel. If they feel dispensable, they are going to make things that are dispensable,” she says. 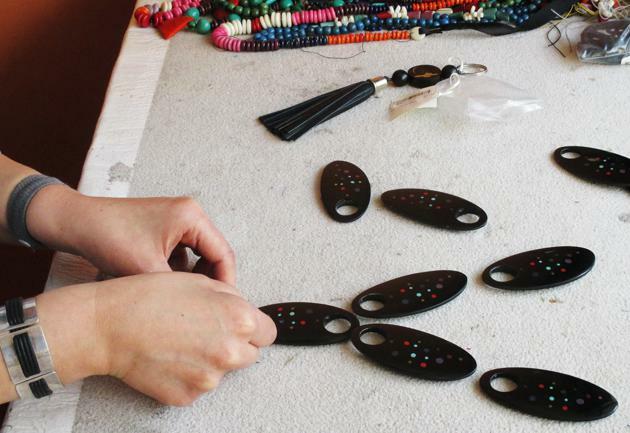 Providing training and educational opportunities for the artisans is essential for Delgado, who works with three groups of artisans on her tagua pieces, one group produces horn items, and one produces resin. Delgado says museums inspire her, and she is a fan of the works of Joan Miró and Pablo Picasso. “I love the mixture of art and sculpture.” Her love for bold colors is reflected in her collections, where the statement necklace plays a central role. Her pieces celebrate multiple cultures. Her Trio bracelet, for example, is made out of fire-glass beads from the Czech Republic and tagua seeds from Ecuador.